Wow them with chapeaus galore! 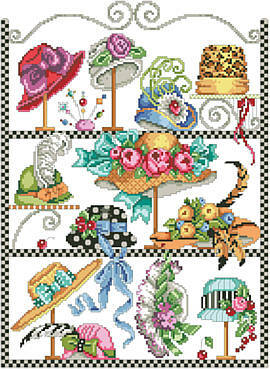 Colorful, novelty hats stored neatly on checkerboard shelves at the ready for any occasion. Feather, fruit, and flower-festooned hats compete with THE RED HAT prominence in a "dressed-to-the-nines" world. Add one dainty, beaded hat pin for a night-on-the-town. Contents: Stitch Count 140w X 192h, Finished Size on 14 ct - 14" X 13"